Patricia (Pat) Eliot was raised in Portland, Seattle and Marin County. She had B.A. and Master degrees from Maryland University, the latter being in early childhood education. She taught in two primary schools in Washington, DC. She accompanied her husband in all of his foreign and domestic posts. When he was at Tufts University in 1978-85, she was the Executive Director of the Association of non-profit homes for the aging in Massachusetts and was appointed to two relevant statewide committees by Governor Dukakis. The Eliots moved to California in 1985 and moved into their newly built house on Sonoma Mountain in 1988. 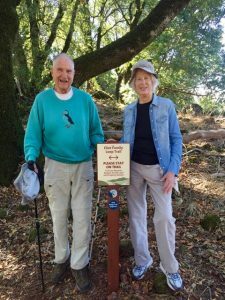 She became active in conservation matters, co-founding Sonoma Mountain Preservation, being on the Board of LandPaths, leading the successful efforts to transfer 600 acres of the lands of the Sonoma Developmental Center to the Jack London Park and opening the East Slope Ridge Trail on Sonoma Mountain. He hobby was horseback riding, and she was elected to the Sonoma County Horse Council’s Hall of Fame. She died on December 4, 2016. Theodore (Ted) Eliot was raised in Boston and Washington and has a B.A. and MPA (Master of Public Administration) from Harvard. He entered the U. S. Foreign Service in 1949 and served overseas in Sri Lanka, Germany, the Soviet Union, Iran and in Afghanistan where he was U. S. ambassador from 1973-78. His domestic assignments were in the Treasury Department where he was Special Assistant to the Secretary, and in the State Department where he headed the Iran desk, and was Executive Secretary and Inspector General of the Department. From 1978-85 he was Dean of the Fletcher School of Law and Diplomacy at Tufts University. He has served on three corporate boards, including the Raytheon Company, and many non-profit boards, including The Asia Foundation, the San Francisco World Affairs Council, Point Blue Conservation Science and the Cornell Laboratory of Ornithology. Since moving to Sonoma, he canvassed for the ballot measures that created, in 1990, the County’s Agricultural Preservation and Open Space District. From 1991-2006 he served on the District’s Advisory Council, and in 2006 he co-chaired the campaign for ballot measure F which extended the District’s life to 2031. In 2008 he co-chaired the ballot measure measure P which provided for a $35million bond for the Sonoma Valley Hospital, He served 6 years on the board of Community Foundation Sonoma County and currently serves on the board of its Sonoma Valley affiliate, the Sonoma Valley Fund.